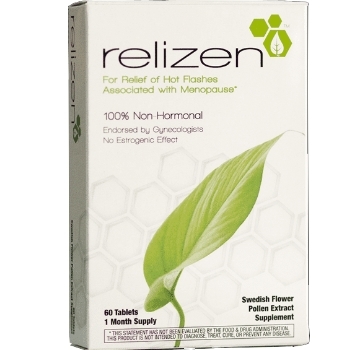 Relizen® is a unique, non-hormonal, oral option made from a Swedish flower pollen extract that provides relief of hot flashes and other symptoms of menopause. Relizen is made from a unique blend of pollen extract taken from flowers grown in the fields of Sweden. Endorsed by gynecologists, Relizen has over 15 years of patient use across Europe. You'll feel good knowing that Relizen has been used safely by more than 1 million women in Europe. In addition, it has been used by gynecologists for over 15 years. Across multiple studies, side effects and adverse reactions were no different from those associated with placebo. If you have specific concerns, you should speak with your doctor or healthcare practitioner.